Awhile back I posted about a new hobby I have been hooked on. Since I need another hobby like I need a hole in my head, right? Wait, don't answer that. Well it's getting bad- I'm finding myself spending more and more time looking for beads and thinking of new design ideas. When it consumes more then a few hours a week I know I have a problem. The two pictures above are the same necklace, different outfits. 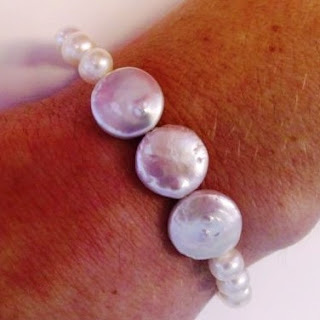 Dainty little pearl bracelet with three flat pearls in the center- perfect for everyday. Now that I'm seeing these all in one spot I think I need to come up with a few different designs besides the multi strand drop bead necklace. Back to the stores that means. These are beautiful!!! I am very impressed! Very pretty. What great hobby..I bet it is kind of theraputic for you to sit down and create these beauties. Very pretty. You need to teach lessons! You are so good at making these! They are really pretty. I picked up some beads last night from the craft store. 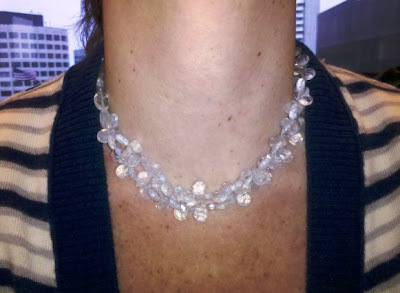 My first beading project. EEEEK. ooooooo I don't really do jewelry (same NOLA necklace everyday) but I love the necklace from the first 2 pics. Clear goes with everything! Perfect. ps: do you have a head? Ooo, I really like your work! 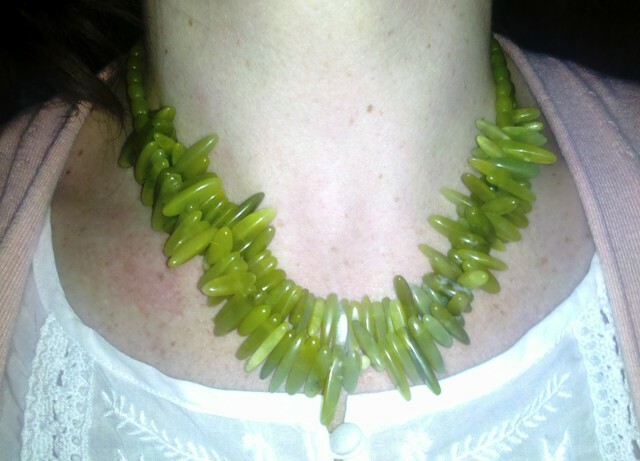 A really bold, colorful piece of costume jewelry can really make an outfit. You may be on to a new profession there! Well your problem certainly produces beautiful jewelry! Love the bracelet too. Fun to do things you enjoy. these are really cute!!! very sweet and classy. Etsy maybe soon? Love your style! The necklaces are beautiful! LOVE these! Fabulous job. I have a friend that does this and will be at the SOWA market selling hers in Oct. so fun. Keep it up and put them on Etsy! Wow! I am impressed with your new obsession/hobby! I especially love the green one and the adorable pearl necklace. Sounds like it could be a hit and a new business for you! Yes, you've fallen down a rabbit hole Alice. However, it looks like your first pass at beading is respectable. I have many friends who are not yet in recovery from the jewelry making addiction. I don't know what it is, but I'm afraid to start for becoming seriously side-tracked. Next will be your Etsy store, then Tucson...for gems. You will be hooked! Be careful! These are great, I particularly love the first one b/c it is so versatile. 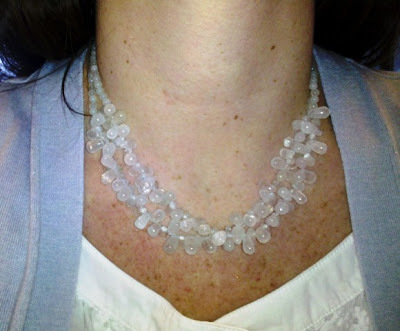 I could see how you would be hooked on this hobby because the result is wearable and fun! What a fun hobby! (And, maybe a profitable one. . . .) Love the green necklace! What a fun hobby to have. There's a great store in my area called Meant to Bead, you would probably love it and want to spend hours there. I particularly love the green necklace you made. Green works with so many colors you will definitely get a lot of use out of it. I love making jewelry as well! It's so much fun. It's time consuming, but rewarding!! Wow! These are so great!! Good job! Have you considered maybe making some necklaces/bracelets for your bridesmaids?? 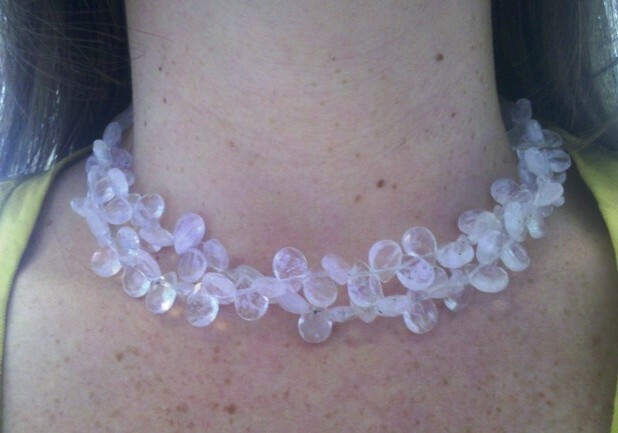 Either to wear at your wedding, or as a bridesmaid gift? ?